COMPLIMENTARY 24-hour Airport Shuttle Service to Tampa International! Our hotel near Tampa Airport is located in the heart of the West Shore Business District and across the street from Tampa International making us a perfect destination if you are looking for a Tampa Westshore hotel. Centrally located, the TownePlace Suites Tampa Westshore hotel is near the Tampa Airport as well as the finest Tampa attractions including University of Tampa, International Plaza, Westshore Mall, Raymond James Stadium and the Channelside District. Choose from a one or two bedroom suite or a studio suite; these rooms are 25% larger than typical hotel rooms and include fully equipped kitchens and large work stations with free WiFi. Guests can maintain their daily routine with our complimentary Connection Center, equipped with 2 computers, printer, fitness room and outdoor heated pool. 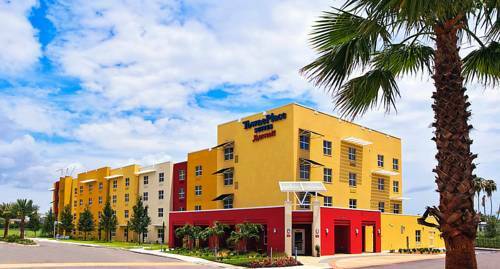 Our TownePlace Suites by Marriott hotel near Tampa airport offers the flexibility and affordability you require!